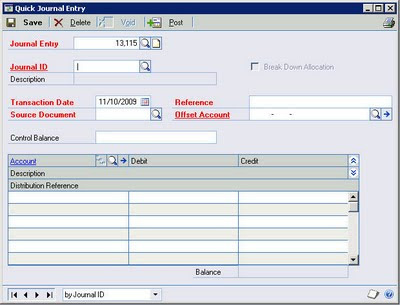 where you add a Description, Source Document, and the Offset Account (the account that will receive the total of the debits/credits - in this example, the Vacation Accrual liability account). 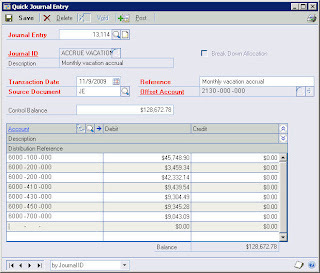 Then, add the rest of the accounts in the Accounts scrolling window. If you want users to be able to override the Offset Account when entering transactions, check the 'Allow Override' box. If you don't want them to be able to override this account, leave the box unchecked. 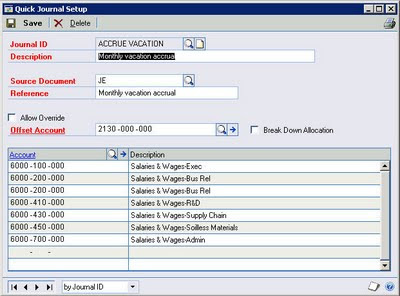 Checking the 'Breakdown Allocation' box allows the printing of distributions for allocation accounts on the Quick Journal Edit List and Quick Journal Posting Journal. After you have all the details of the Quick Journal entered, click 'Save'. The Quick Journal will now be available for recurring use until it is deleted.